Mark Cavendish will return to cycling at Sunday's Tour of Britain after breaking his shoulder blade during the Tour de France in July. 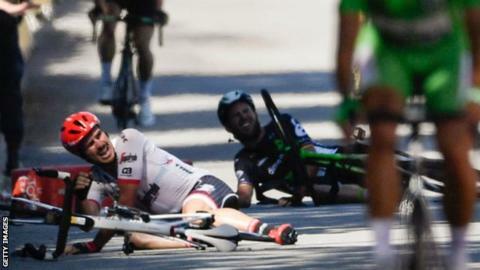 The 32-year-old withdrew from the Tour after colliding with Peter Sagan and hitting the barriers during the sprint finish on stage four in Vittel. Cavendish will ride for Team Dimension Data, who are chasing a third consecutive Tour of Britain title. The Manxman is a 10-time stage winner at the event. This year's Tour of Britain begins in Edinburgh on Sunday and finishes in Cardiff on 10 September. Cavendish has 30 stage wins at the Tour de France, and had been chasing Eddy Merckx's record of 34 when he had to pull out of the race.